Imagine you and your friend walking in the woods to search savoury mushrooms, suddenly you reach the point where various sorts are surrounding you, within arms-length several mushrooms can be picked. But, your friend also has their eyes set on some of those deliciously looking Fungi! So, the battle begins! 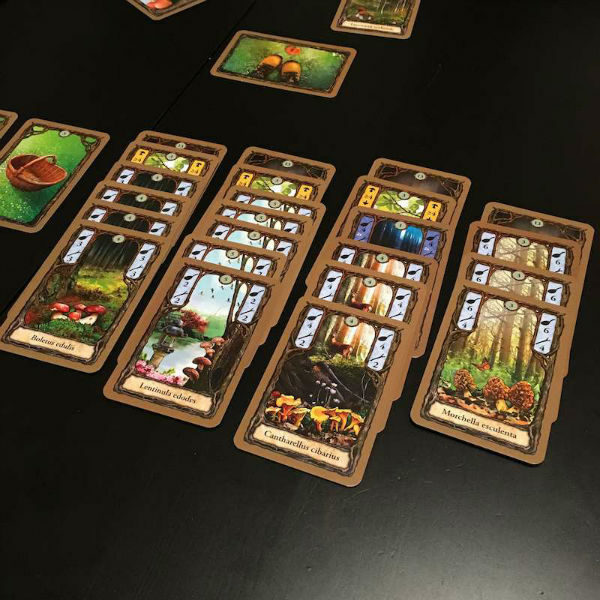 A line of 8 forest cards will be placed at the center of the table and at one side of that line a pair of feet will be placed in front of it, to serve as a marker. On the other side of the line, on its corner, the stack of remaining forest cards will be put. This line of cards represents the forest within your reach. The pair of feet show what's right in front of you within arms-length. On the opposite corner of the forest lines stack of cards, there will be a decay pile. At the end of each turn, the forest card closest to the decay pile ends up here. The decay pile has a limit of 4 cards, so these will be discarded after the limit is reached at the end of that turn. I will explain a bit more later. 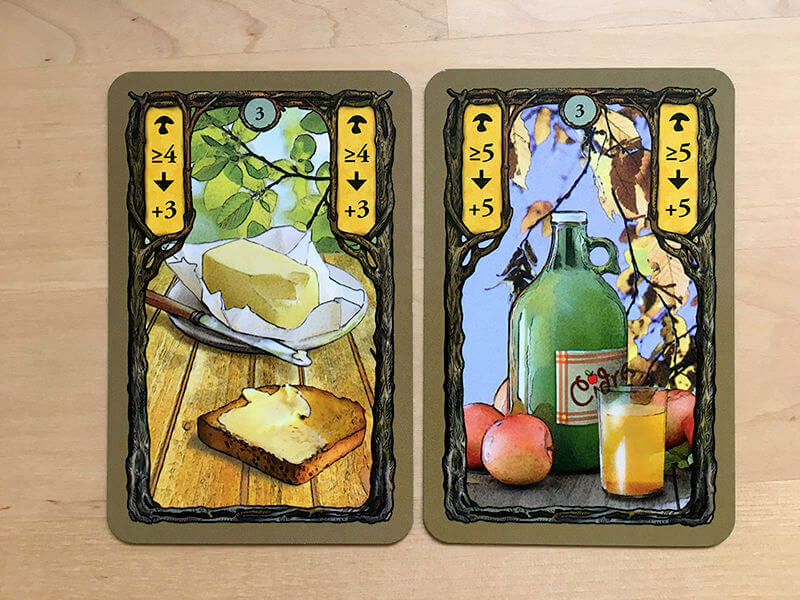 The forest cards do not only contain mushrooms, they can also contain butter, cider, a basket, a frying pan or a moon card. It will be up to you to collect what and when. Frying pans are needed each time you want to fry mushrooms (you cannot reuse pans), so ideally you have a few spare pans. 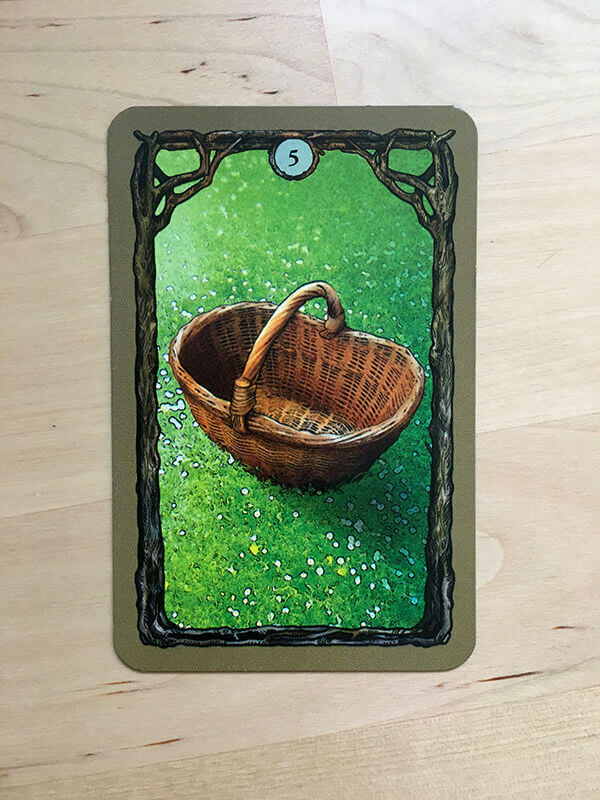 Baskets allow you to raise your hand limit by 2 cards, the hand limit starts at 8 cards and there's no limit to a number of baskets you can own. The moment you obtain this card it becomes active, so this is not a hand card. Butter and Cider are both flavor enhancers, they will raise the flavour points of your mushrooms but they require a minimum amount of mushrooms. E.g. You need at least a set 4 identical mushrooms to use the butter and then it will add 3 flavour point to the total of that pan's contents. Fly Agaric is a poisonous mushroom type and will never be in your hand. The moment you obtain such a card it is triggered and forces you to trim your total hand limit by 4 cards. Luckily this only lasts one round, the next round you can discard the Fly Agaric. Edible Mushrooms are the ones you want to collect for gaining flavor points. 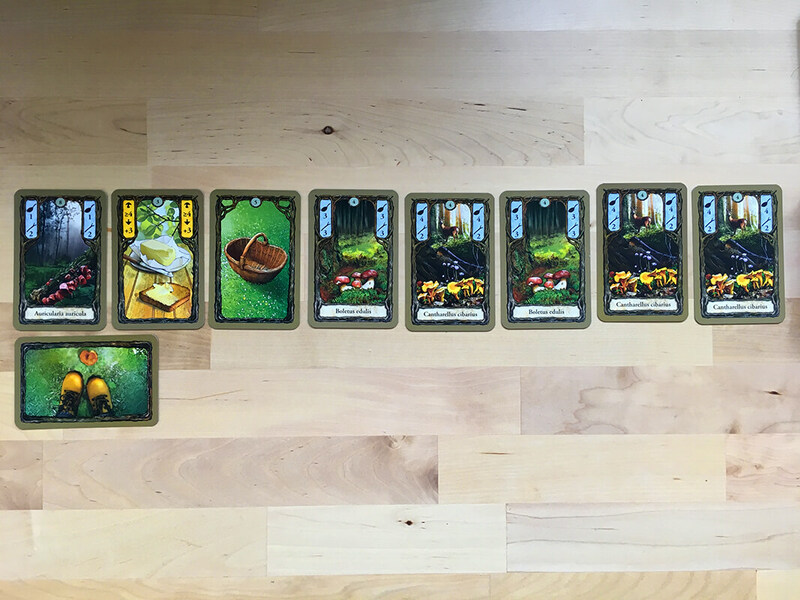 Each of those mushrooms has a frying pan symbol with a number beneath it, those represent the flavour points per card. 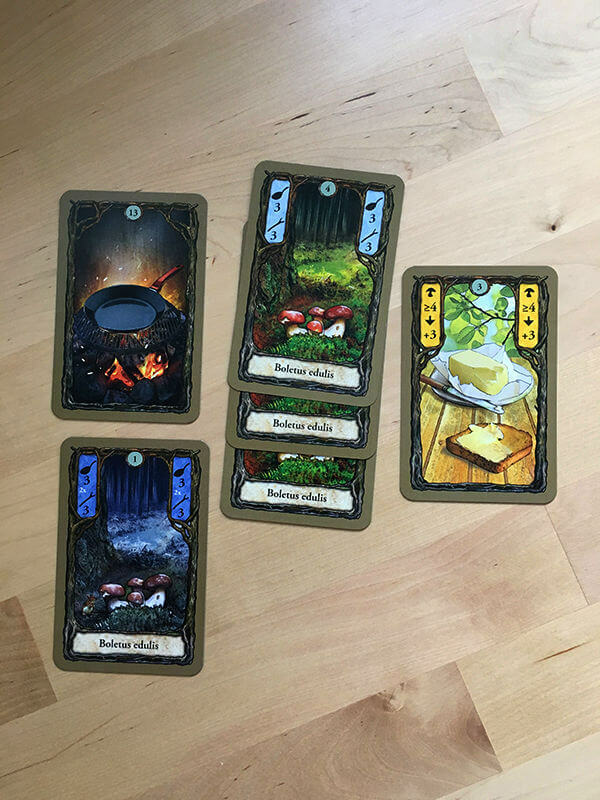 There's also a stick symbol with a number on each card, those are a number of sticks you'll get when selling at least 2 identical mushroom cards. E.g. the mushroom card says 2 sticks, so if you sell 2 cards, you get 4(=2*2) sticks. (More on this later) There is one more number on the mushrooms cards, one that tells you how many of that type appear in the game (without the night cards). 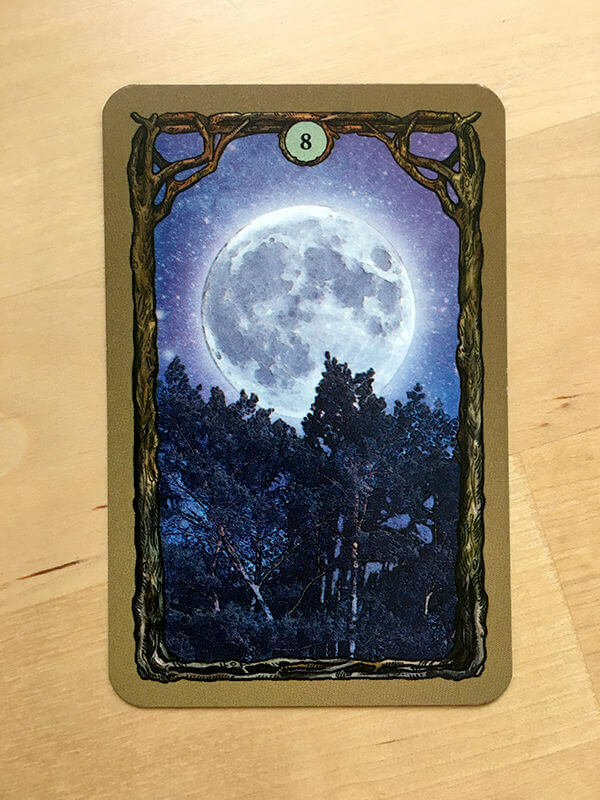 Moon cards represent mushrooms that can be gathered during the night. Each edible mushroom type has one corresponding night card, except Morels. 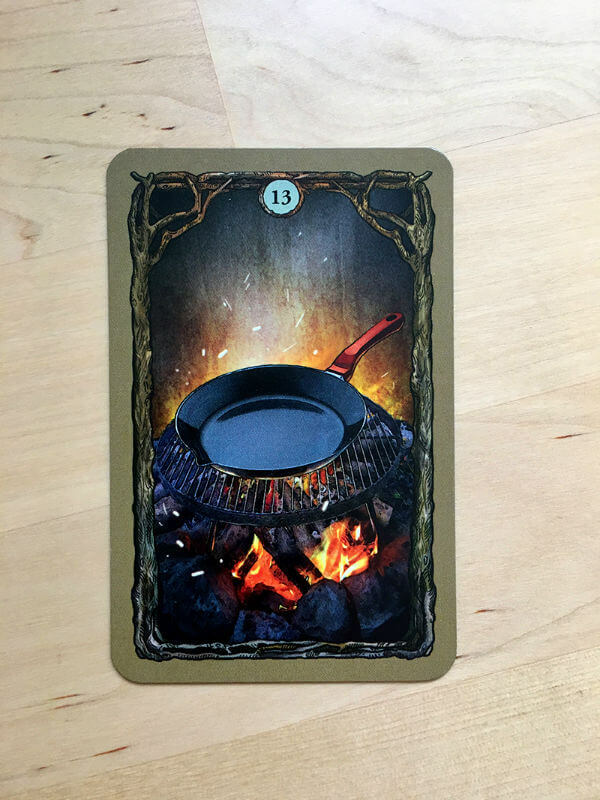 The night version of the mushroom doubles the amount of flavor points and sticks of that card. 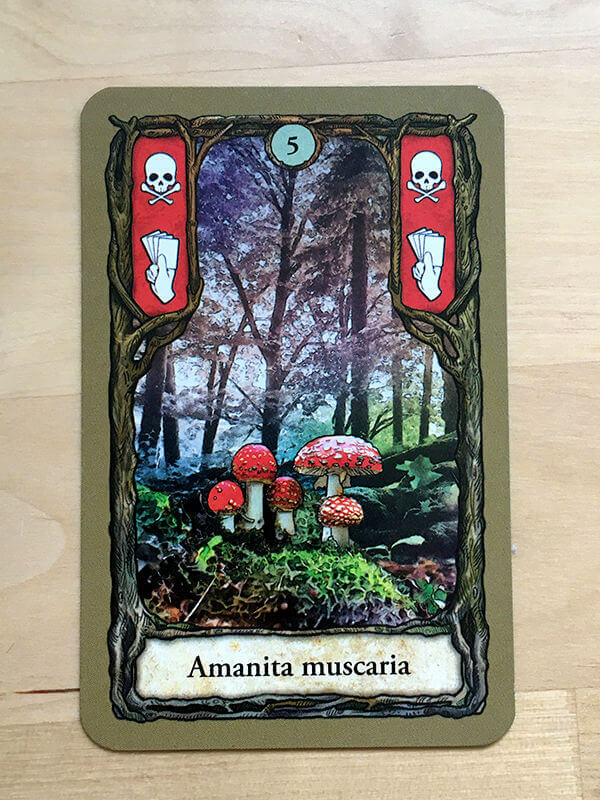 When you draw a moon card, you have to trade it in for a night type mushroom, however, you just draw the first one from the night mushroom stack, which makes it totally random. 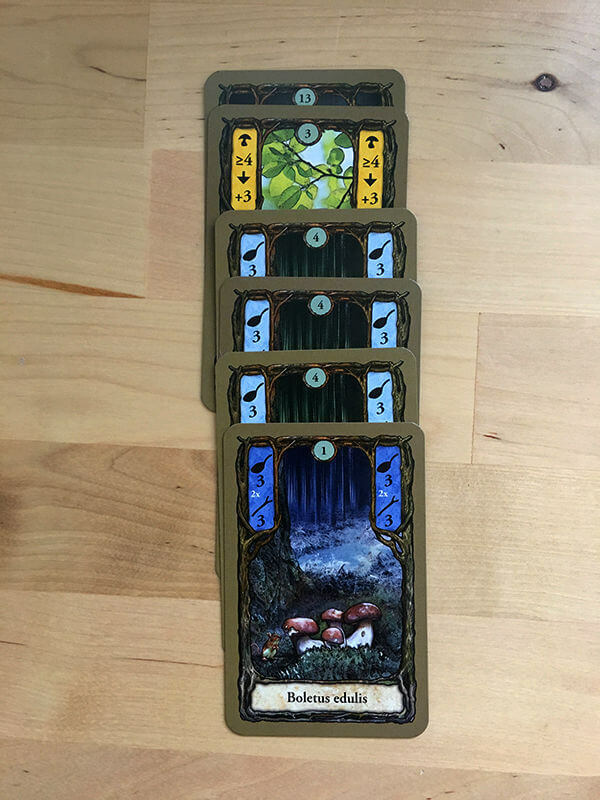 The line of cards representing the forest is divided into 2 parts, the part in front of you (which is within arms-length) and the deep forest part, which needs more effort. 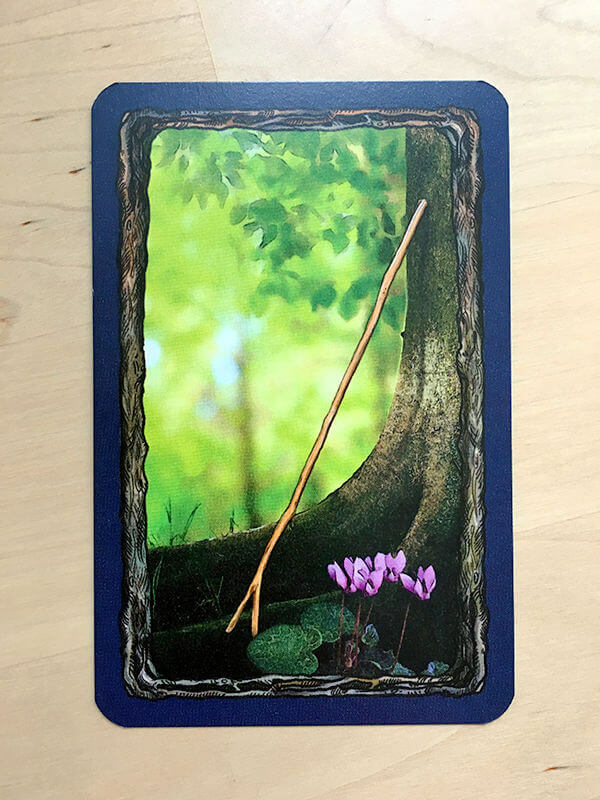 To be able to reach into the deep forest you need to use sticks. 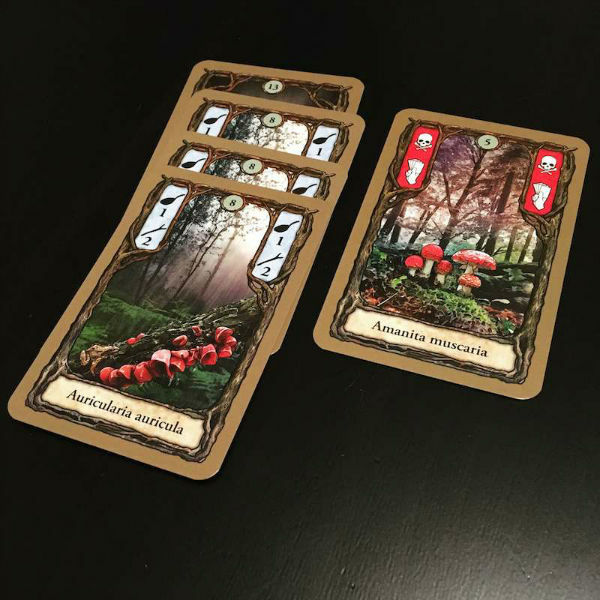 As I explained a bit earlier, sticks can be obtained by trading at least 2 identical mushrooms cards. A number of sticks you'll receive is dependent on the mushroom type you're trading in. So how do you use those sticks? When you want to obtain something from the deep forest you expend the same amount of sticks as the forest depth it is in. So without counting the 2 cards that are right in front of the feet, there are 6 cards. This means the max depth of the deep forest is 6 and the furthest card will cost you 6 sticks. So the first card next to the 2 within reach would cost you 1 stick. You already know that you need a frying pan and edible mushrooms to be able to cook them. But there are some other conditions to be able to cook. you can even use butter and cider together if you have at least 9 identical mushrooms. butter and cider can only be used during cooking, not added afterwards. Once used the frying pan and its content stays put until the end of the game. As I mentioned before, you get flavour points when you cook edible mushrooms and are able to enhance the amount by using butter, cider and night time mushrooms. For example, when I collect 3 identical Porcini's (Boletus edulus) and the night time equivalent card, I have 4 identical Porcini's in total, so I am allowed to add some butter to my frying pan too. The Porcini's have 3 flavor points each (3x3) + (2x3) from the night time card + 3 flavor points from the butter, this means that this pan contains 18 flavor points in total (9 + 6 + 3)! At the end of the game, all the flavor points per used frying pan will be added and the person with the highest total wins the game! short to medium length play time, it varies from 20 to 40 minutes.